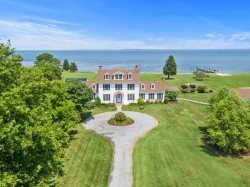 Welcome to Woodwind, a true Tidewater Colonial located on a large westerly expanse of the Tred Avon River. Woodwind offers privacy, views, amenities, and luxury. Capable of housing multiple families, the main house has ample space for gathering or grabbing some real estate for a little "me time." When it's time to prepare those well-planned gourmet meals, you'll enjoy the flow and conveniences of a chef's kitchen. Serve your creations inside or out, as there is ample seating in either venue location. The waterfront screened porch is a treat for relaxing and entertaining. When you're not enjoying the main residence you can enjoy multiple outdoor living areas while keeping an eye on the kids, swimming in the pool, soaking in the hot tub or playing in the front yard, all while basking in the views of your piece of the Eastern Shore. Need a drink or a snack? No need to go running into the main residence when you can keep refreshments close at hand in the pool house. explored. So don't hesitate, Woodwind can be your private escape on the Eastern Shore when you book your Baycation TODAY! !